The job of welding the holes in the galley roof is well under way. 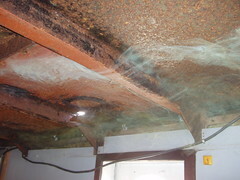 Here you see smoke drifting across the galley roof while Robin welds on the deck above. 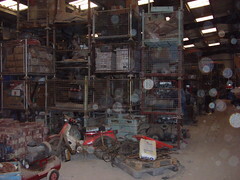 Welding produces a distinctive, but not unpleasant, smell. So far we have patched four of the holes in the galley roof. 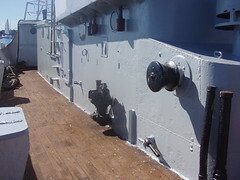 After some discussion I opted to weld patches over the holes without cutting back the rusted metal and cutting plates to fit the holes as we have done elsewhere, simply because I did not want to create any more havoc in the galley than strictly necessary. 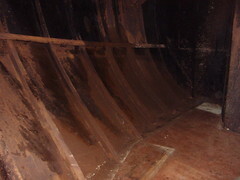 The issue of cutting into the galley with oxy-acetalene is that it is very messy, combined with a risk of fire, with hot melted metal flying all over the place. Right now I have two more holes in the galley roof to weld over, then a vent to the galley and a vent to the shower room to replace and I'll finally be able to prime the back deck. 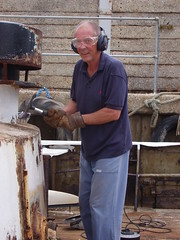 Cleaning up in the stern accommodation space is progressing well, mostly due to Fred's efforts. I've still not decided what's best to do, to clean off the remaining pitch then prime and paint the hull from the inside, or to simply smother any uncoated metal with pitch as about half of it is already done for me. Either way, I have to do something or else the rust will set in behind any insulation and paneling I put in. I must say, I'm tending towards the paint option, simply because it is cleaner and would not smell. I'm also thinking what it might be like if I need to get in there to do some work if everything is covered in filthy black pitch. Mind you, cleaning out the pitch that's on the metal at the moment is going to be a dirty job. I know I go on about rust all the time on this blog, but the fact is dealing with rust is a big part of my life right now. Here though is the last of the 'big' rust on Lady Jane. Like so much else on board, this is the result of years of neglect. If I had been thinking about the photo opportunity at the time, I could have saved a much bigger piece. 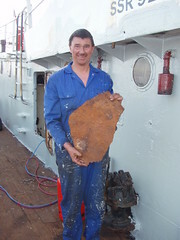 The rust came from a section in the aft accommodation where one of the outlets to the sea had been leaking at some point. There is evidence of repairs having taken place, but I'll still need to check the pipework carefully to ensure everything is now sound. 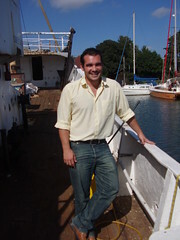 As you know, I'm generally interested in boats, the sea and all that good stuff. Here is a web page on some naval traditions which I found fascinating. It's amazing what a difference that first coat of primer topsides has made to Lady Jane. For those of you who read this blog and have seen Lady Jane in the flesh, you will really appreciate the significance of this picture. Now I can stand on Lady Jane's deck and hardly see any rust at all. There are patches left, I know, but those will soon be gone. I have learned an enormous amount about paints and painting in a marine environment. The two biggest lessons have been that proper marine paint is expensive and that you have to do it properly or you are just wasting your time. I originally started painting on board Lady Jane using Rustroy and the white paint that that the previous owners had left on board. To my mind, Rustroy is a primer and the writing on the white paint tins said Paint, Finishing, Ships so it should have all worked ok. Wrong. It turns out, as best as I can tell, that the white paint I had used is pourous, and the Rustroy only converts the rust to make a surface suitable for painting on top of, and is no use as a primer in it's own right in a marine environment. All of the white painting I've done on the boat has rust showing through to some extent or other. There is no real harm done as, asides for the footings on deck, I have caught it in time and believe I can just coat what I've already done with proper primer. I'll have to start from scratch with the rusty footings. Thankfully though, it's a fairly minor task. The issue of what paints to use is by no means a simple one. The paint system I'm now using is a base of Rustroy, followed by two or three coats of two pack epoxy primer, to be followed by two coats of two pack epoxy paint. Ideally I'd shot blast Lady Jane and start from clean metal with epoxy primer but, due to cost, that is not an option. I'm also trying two different types of epoxy system, one from W&J Leigh & Co the other from Hemple Marine. Hopefully it will be quite some time before I'll be able to judge which is the best paint system to use in the longer term. If anyone out there knows any better, feel free to get in touch before I start on the hull. One of the boats in the marina next door to Lady Jane has a parrot on board, not the one in the picture, that's a picture of a Greek parrot which I took while in Kos last year. 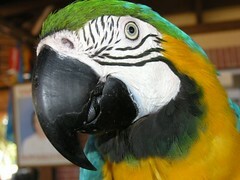 Anyway, the parrot has quite a repertoire of sounds, some of which can be annoying if you start to listen too closely. Amongst the sounds it can do, it seems particularly good at barking like a dog and wailing like one of the many sirens you hear from the emergency services using the road behind us. I was sitting on board, after a long day's painting, when I could swear I could hear the distinctive sound of a chipping hammer on the side of Lady Jane. It turns out it was the parrot. Given that the neighbors have 'asked' me not to chip rust on the weekend, as the chipping hammer is quite noisy, I'm not sure that this latest development is going to go over too well. The workbench has finally been put to good use. Here you see it on the platform alongside Lady Jane. Using the bench like this means I can reach pretty much all of Lady Jane's sides for rust busting and subsequent painting. I'm not sure how I'll reach the very top bit though, it feels very high when you are up there. The reward for reaching there will be to finally knock off those big flakes of rust you can see in the picture, right at the top there. I don't know why, but it's immensely satisfying to knock off big flakes of rust. It should be the reverse, I should want to weep at seeing yet another piece of Lady Jane dropping off. On the subject of rust busting, I'm now not far away from completing the chipping of all of the rust from the starboard side of Lady Jane. All I have to do is a last, quite big, section at the bow and one final section right at the stern. Of course I have numerous people to thank for their help at chipping away the rust over the last few months, all of whom have offered more help by the way. I have a few more holes to deal with. These are in the forward section of the wheelhouse block and, as far as I know, were for the drive shafts which used to power the big winches on deck. 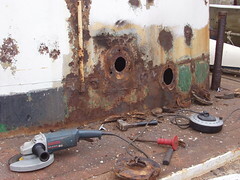 These holes had previously been plugged with rags after the shafts were removed more than a year ago by the previous owners, but as part of the process of cleaning up the wheelhouse and galley block they will finally be welded shut. I've started this cleanup as part of a big push on painting Lady Jane. My thinking being that if there is a chance she is going to be on national television, I want her looking as good as possible. At least I've known about these holes, not like some of the others I've discovered where the metal has been rusted completely through. Fred, who is retired and lives locally, has been a willing volunteer on Lady Jane for over a week now. Here he is armed with a hammer, chipping away at the ever present rust. It is the slow, steady progress against the rust that will win the day. At the moment Fred is putting in a couple of hours a day when he can, partly as a form of exercise, partly for the love of boats and partly as a means of paying back a favour to someone he knew, also from Zimbabwe, who has long since disappeared. Fred came to help through Malcolm, who happens to live literally right across the road from Lady Jane. I got to know Malcolm through his son-in-law, John, a good friend who lives in the same village as me. It is strange how things work out sometimes, you just can't make this stuff up. Over the weekend, between Fred and myself, we achieved great things on Lady Jane. Thanks Fred. Luke, from the BBC came to visit. I sent the BBC program DIY SOS an SOS e-mail and was pleasantly surprised by the response. DIY SOS is essentially about people who have impossible DIY projects that they really need help on. I think I probably qualify on that score. After a few phone calls and e-mails, Luke came to visit Lady Jane yesterday. I must say doing a tour of the boat while being interviewed on camera is a bit strange. Could be, if things go well, I'll have a huge leg up on Lady Jane's living accommodation and finally get to literally live (on) my dream. The bonus being I'll be on national telly. It's inevitable on Lady Jane - One thing that needs fixing leads to another, which leads to another and so on. To be honest, the back deck did not look so bad to me, so I started work on what I thought it would be a fairly straightforward task, quickly achieved. The deck was to be a sort of proving ground before I started on the more committing, and expensive, task of properly priming and painting the hull. Also, having that deck painted green would help make Lady Jane look so much better. The holes in the deck under all the rust was a bit of a surprise, but I'm making progress there. Now though, I've had to take down the ceiling in the galley, so as to make cutting and welding the holes above the galley safe. The last thing I need is a fire on Lady Jane. After unscrewing what felt like about a squillion screws, (A squillion, is there such a number? It may have been more) the extent of the mess is finally revealed. One of the last places on Lady Jane that was reasonably clean and comfortable is now starting to look worse than a building site. 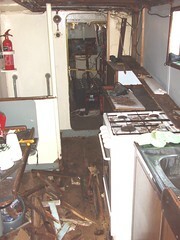 I've got too much else to do, so sorting out the rust in the galley will just have to wait. I'm thinking I'll fix the holes, slap on some primer, then bodge some sort of ceiling back up as soon as possible. We have made a start on patching the holes in the rear deck. Here you can see Robin grinding the edge of a hole cut into the very back of the deck, ready for a new piece of steel to be welded into place. We have cut back the rusty bits, making a neat line in good steel using an oxy-propane cutting torch. This gives us a good edge to weld the new plate onto. 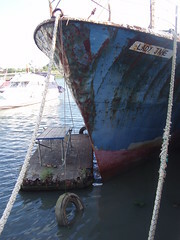 In this spot the stern navigation light used to sit on a bracket, between two edges of the deck railing. Water had obviously seeped into the gaps, where painting would be difficult, and worked it's way into the underlying metal. 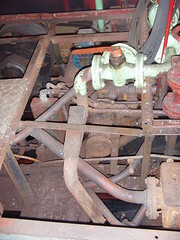 The bracket and deck plating were completely rusted away. The navigation light, bracket and the rest of the stern railing will all need to be restored, but for now the focus is on sorting out the holes in the deck. So far, on the rear deck, I have two holes fixed and six more to go. This boat appeared at the marina next to Lady Jane. She was a lovely motor cruiser, excellently finished. 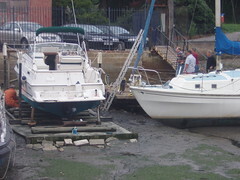 As the tide went out, the owner, at least I presume it was the owner, cleaned the hull below the waterline using a jet wash, then proceeded to paint the hull with anti-foul. It was quite a lengthy process and what made it amusing for me was the committee you can see on the right of the picture which had assembled to stand around and watch, and occasionally give advice. Helpful, well meaning advice I'm sure. As the tide was coming back in I had a brief word with the guy, he looked so pleased to be finished in time.